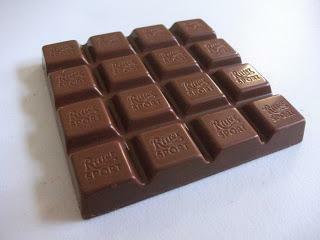 Many thanks to the fantastic Monster Sweets for sending me this Ritter Sport bar to review recently! 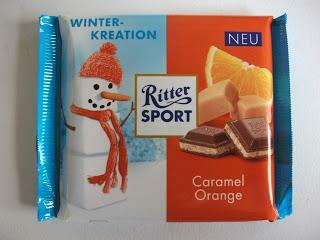 This is a new addition to Ritter Sport's 2013 Winter Kreations range, which comprises of Caramel Orange, Kokos-macrone (Coconut Macaroon) and Gebrannte Mandel (Caramelized Almonds). 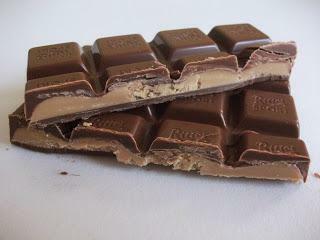 Do take a moment to check out Monster Sweets newly revamped webstore - they stock a lot of hard-to-find European and American snacks at competitive prices, including an extensive variety of Ritter Sport and Milka bars. I highly recommend them for unique and tasty snacks that you won't find anywhere else in the UK! Onto the chocolate then, this Caramel Orange bar had no English writing on the packaging but it roughly translates as "Milk chocolate with caramel and orange flavor cream". I've tried the Ritter Sport Crema Catalana bar before and this Caramel Orange sounded like a very similar proposition, and indeed it was! Infact I would go so far as saying it's better than the Crema Catalana, which is high praise coming from me as I absolutely loved that bar! The filling combines the rich, buttery flavor of smooth caramel cream with a subtle tang of orange, all coated in creamy milk chocolate. It's the perfect flavor for a Christmas-themed bar as it evokes the taste of Terrys Chocolate Orange, but is much more luxurious. The caramel cream is just delightful and tastes creamy and extremely moreish. I found myself constantly reaching for "just one more" piece, but that's not to say it wasn't satisfying - it's far more filling and substantial than most cheaper chocolates out there! Overall, this is yet another fantastic creation from Ritter Sport which I can't recommend highly enough. Ritter always come up with some great combinations and this bar is no exception, it's just a shame it's a Christmas limited edition and not easily available in the UK. I would definitely recommend giving one of these as a Christmas gift instead of Terry's Chocolate Orange this year! 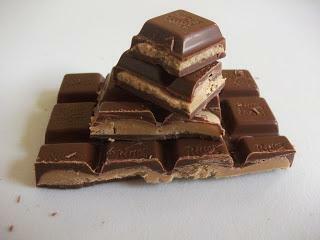 Please stay tuned for my review of the Ritter Sport Winter Kreation Coconut Macaroon bar! Available from: Monster Sweets Online Store. Price: £1.75 per 100g bar. Allergy Information: Contains milk and soya. May contain traces of nuts. *I was sent this bar for an honest review by Monster Sweets and all opinions expressed are my own.